Nothing can be managed without first managing our own self. In modern management self-management means mainly management of the outer work-environment of the individual like for example time-management. In the Indian thought self-management means managing of our inner self. However, recent trends in management thought is veering towards this Indian concept of self-management. In an integral perspective both may be included in the ideal of self-management. But management of the inner self is or has to be the foundation for managing the outer environment. For, someone who cannot manage himself cannot manage others or the outer environment. In a psychological approach to government of the outer life or “Corporate Governance” has to be based on self-governance of the individual especially by the leaders of the organization. This brings us to the question how to assess self-governance. The traditional method of self-assessment used in modern research methodology is “Questionnaire”. The first question we have to ask is what is the purpose of the questionnaire? If it is to assess the degree of self-governance achieved by an individual, then the traditional method of questionnaire with Yes/No answers, is not only ineffective but can also be misleading. For a psychological and subjective phenomenon like self-government, the right approach would be to provide some broad guidelines or signpost for self-assessment. Effective self-governance requires three factors: first is consciousness, alertness, vigilance, awareness; second is inner detachment or stepping back; third is firmness and sincerity in the Will. Every individual can assess his “self-government index” in terms of these three factors. 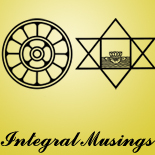 This entry was posted on September 24, 2012 by integralmusings in Harnessing the Human Potential.